The best chart software programs make it easy to convert raw data into simple to understand business insights by creating an illustration, such as an infographic or image, for use in a document or shared online. 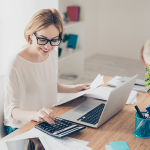 We looked at the most popular chart software programs that covered the range of options for small businesses in terms of ease of use and available features, such as editing tools and templates. We recommend Venngage as the best chart software for small business because of its ease of use, affordability, and great templates. Venngage is intuitive and because it doubles as infographic software, you can add more illustrations and images after your chart is built. Our Venngage software review indicates that clients love this charting software program. It’s easy-to-use and extremely flexible. Take a look at some of the beginner templates shown above. How easy is it to use Venngage? This simple bar chart below only took us two minutes to build using a template and existing data. It provides a fictitious example to graph where sales leads are coming from. The same chart could be created in Excel or Google docs, but the visual representation of the data would be much less engaging. Even in the free version, you can import data from Google drive, or you can cut and paste data into the built-in spreadsheet shown on the right-hand side of the screen above. Venngage offers three plans — Free, Premium, and Business. The Premium Plan costs $19 per month and unlocks all the templates. The Business Plan costs $49 per month, adding priority support and training. Venngage is also free to use with a limited number of templates. Users can also get discounts from 12% to 20% with quarterly and yearly subscriptions. In addition to visualizing data, you can create timelines, social media graphics, and even develop a step-by-step process guide. Add photos, draw arrows, write additional notes — whatever your creative mind desires. You can choose from many different fonts, set custom colors, and adjust size and placement with ease. This is important, since there’s often more to the story than just the data on the chart itself. Venngage has a help center that’s available 24/7 by sending an email from their website. They also have online chat available Monday to Friday at all hours. There is no phone number to call them directly. You have to buy the premium version of the software if you want to be able to access all the diagram templates and/or export to a PNG image or PDF document. Venngage may not be able to handle more complex or 3D graphing, but it actually made our simple bar graph dataset look better than MS Excel or Google Sheets. Infogram is great for small business users who want to display interactive charts. By embedding a chart on a website, users can click between # and % and watch as the graph changes. In addition, you can add text, objects, images, and media – similar to Venngage. However, the template required a bit more manual formatting than Venngage. Similar to Venngage, Infogram is chart software with robust diagram-making capabilities.Their primary advantage is offering responsive charts – that is, where a user can press a button or a tab to see a different view of the data. They’ve also recently added templates for infographics and Facebook posts as well as existing chart and map templates, as you can see in the image below. In our example, an interactive chart would be helpful if we wanted to show the raw numbers as well as a percentage. Or, if you have data for more than one year. With just a click of a button the viewer can toggle back and forth. Using the same sales leads chart we created in Venngage, Infogram allows the viewer to see either the number of leads or the percent just by clicking the respective tab. 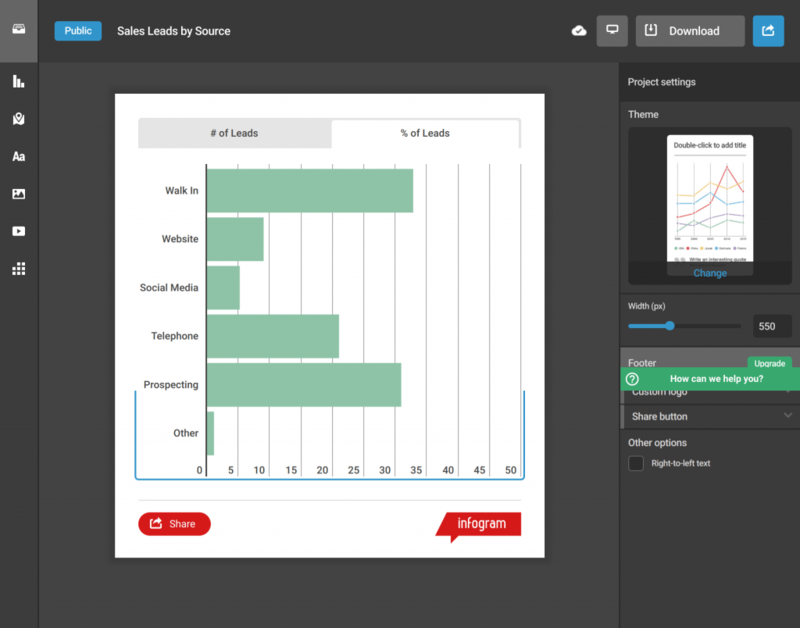 The free version of Infogram lets you save up to ten charts and provides access to ten types of maps. Infogram pricing starts at $19 per month, exactly the same as Venngage. However, to get team functionality, training, and dedicated support, you’ll have to upgrade to a Team plan at $149/month. That’s a lot for a small business to spend. Infogram has all the basic charting features you expect, but adds analytics if you upgrade to Pro. That lets you compare data over time, much like a spreadsheet, but in a visual and clickable form. Otherwise the only extras you get with a paid plan are more templates and more projects. Infogram’s customer support is better than Venngage. They not only have a phone number you can contact, but they provide a blog, online video based tutorials, open online chat, and an email customer service option that’s available 24/7. What ultimately kept Infogram from the top of the list was the lack of formatting tools for charts. For example, you can’t adjust grid lines. In addition, you must upgrade to a much more expensive Team plan to get access to training and dedicated support. Smartdraw is best for businesses that have someone with graphic design skills on staff. You can use SmartDraw for all your business drawing needs, but it’s a bit more complex to navigate … so having some creative skills is an asset. SmartDraw is in a slightly more advanced design category than Venngage and Infogram. It’s a drawing tool that also makes charts and diagrams and it just happens to have many well-designed templates in addition to the basic ones shown below. SmartDraw provides over 70 different types of charts and diagrams — retail planograms, venn diagrams, infographics, org charts, and fliers among many others. You’ll want to have a bit of design savvy to use some of the more advanced features in SmartDraw like styles and themes. SmartDraw ranges in price from $9.95 per month for one user to $5.99 per month per user for up to five users. The only difference in the two plans in the number of users, otherwise the features are the same. There’s also a desktop version for $197 per user license. With SmartDraw you’ll have infinite options for customization. SmartDraw is a great choice if you need to draw other types of diagrams, such as org charts, and want to share them with others via Dropbox, Google Drive, or OneDrive. All features like printing, exporting and integrations are the same regardless of the plan you choose. Data can be imported from Google drive or a CSV file, which saves time. Of course, Venngage also allows you to import data, but only using Google drive — not Excel like SmartDraw. SmartDraw provides support by phone, email, or online chat Monday to Friday from 6am to 5pm PST. SmartDraw works more like a drawing tool, hence its name. You may find that having some graphic design skills helps. However, HR users gave it great reviews for its org charting features. Nonetheless, it’s a bummer that the free trial is only 2 days. Creately is best for small businesses that need quick access to a free solution. Of all the chart software programs we reviewed, Creately offers the best free version. Creately is the only charting software that didn’t require any registration in order to start using the free version. And the free version does a lot! Like the other chart software programs, you can import data and use templates. 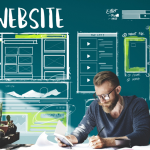 But unlike those programs, Creately templates have user ratings so you can choose from those templates that are the most popular like business plans, org charts, process maps, mind maps, or nearly any other kind of chart you can think of. See a small sampling below. Like SmartDraw, Creately looks and works more like a drawing program than a chart program, so it may scare off first-time users. Nonetheless, the interface is easy to use — even for a beginner — as shown in the screen capture below. And there are many existing diagrams ready for you to borrow and customize, even in the free version. In addition, you can publish your chart to a website or social network and allow others to add notes and comments with the free version. Other chart software, like Venngage, requires you to upgrade to a paid package before you can publish your charts online. Creately is very competitively priced, but the free version is so robust that you may never need to pay for it. Paid versions run from $5 to $25 per month. The price increases as you add more than five users, but not by much. For example, 25 users would only cost $75 per month. Creately offers the same features as the other charting software options we reviewed, but adds the ability to collaborate on charts with other users. This is great if your team is virtual or you’re working with offsite contributors. The only difference between free and paid plans are the support and the import/export options you get. With Creately you can search for answers online or send a support request via email. However, the robust user community is a great help to answer chart-specific questions. While you don’t have to register, you do have to install Adobe Flash in order to use Creately. In addition, if you want to create a simple bar chart or pie chart, you have to draw the diagram yourself using shapes as there are no standard templates for the simplest of charts. Also using the free program you can’t import data from Excel or Google Sheets like you can with most the other chart programs’ free versions, so you’ll have a bit of data entry to do if you have lots of data values. LucidChart is best for businesses that need to create flowchart type diagrams and for people who have experience with more enterprise-level software like Visio. LucidChart is a another software like SmartDraw and Creately that creates many different types of charts, but it focuses more on flow charts, such as mind maps, circuit diagrams, family trees, venn diagrams, floor plans, and org charts. Flow chart templates abound on LucidChart, but the interface is little more industrial, like Visio, rather than user-friendly like Creately. LucidChart is not designed solely for data charts and it’s a bit complex. On the positive side, you get more flexibility — you can draw different shapes, create multiple connections, and even update data in a linked spreadsheet to have it automatically revise your chart. By upgrading to the Pro or Team plan you can share your chart on social media. An example of template is shown below so you can compare the interface to Creately and SmartDraw, which offer similar features. LucidChart offers a free version. Its paid versions cost $5.95 for the Basic plan up to $24 per month for the Team plan, with discounts up to 17% if paid annually. The only difference between Free and Basic is the amount of storage you get; whereas the higher priced plans allow more users, and have import/export options. So cost wise, it’s comparable to SmartDraw and Creately. LucidChart has the same basic features as the other chart software, such as editing tools and templates. If you upgrade to the Pro or Team plan, you can import and export existing charts and data from Visio. However, LucidChart is designed more as a whiteboard where you can drag and drop boxes for more free-from and complex diagrams. The Pro and Team plan also let you link to data in MS Office and Google docs; so when you update the spreadsheet data, it automatically updates the diagram. LucidChart’s help center was one of the more difficult to navigate. There’s no phone support and you have to click through a series of menu items to find your own answers on the knowledge base. You can send a help request by email, but have to login first to access that function. No support hours are posted, but they claim a 12-hour turnaround on email requests. While feature rich, LucidChart requires more manual work since you have to add each shape, arrow, and text box on the chart if there’s not a template you like. The interface is also a lot more complicated since there are far more options for creating objects and formatting the chart. Of all the programs we reviewed, LucidChart had the most complex interface. And it has no online chat for support. Without the right software, the seemingly small task of creating a chart can give you a big headache. Whether you need a diagram to spice up a presentation, publish online, or need to create an engaging infographic, being able to customize your chart and add graphics will help bring your data to life. We recommend Venngage so highly that we use it at Fit Small Business ourselves. This is because we can easily save our color schemes and annotate our charts, among other benefits. I loved the list and now considering trying some of the apps featured since I do need an online drawing service. However, the item which lacks is ConceptDraw PRO tool, I’ve been using it for a while and it is perfect when it comes to versatile ready-made objects and templates along with a 24-hour support. The problem is that it is still not that affordable even for a life-time licensing model. Thanks for sharing your experience. We deliberately choose to omit packages that are overly costly and instead include those tools best suited to small businesses, that provide great features at a great price.